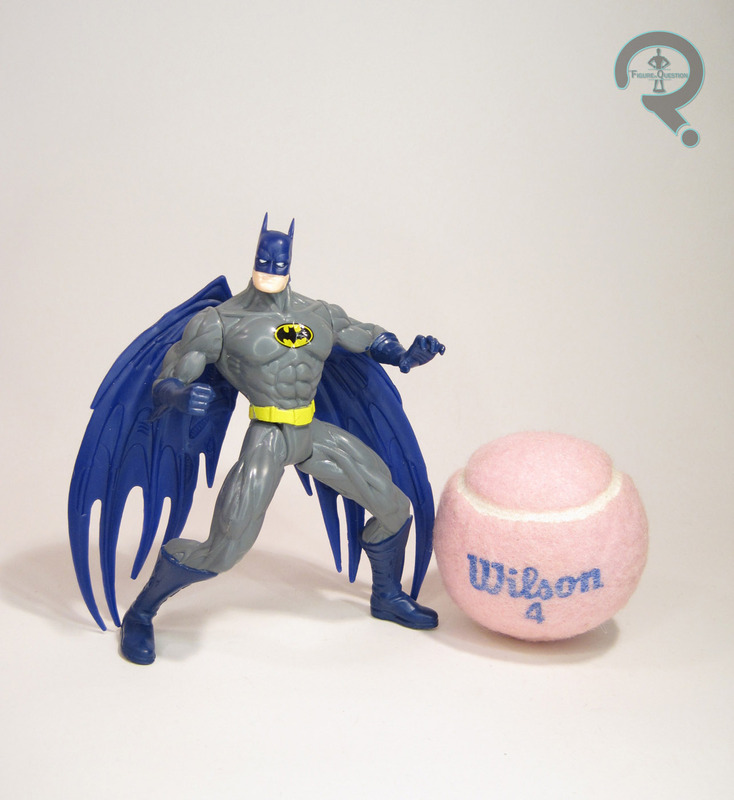 In the ‘90s, any DC product that wasn’t Batman was a serious rarity. Less than a decade after the expansive Super Powers line, Kenner’s only full DC line was Total Justice, a line that didn’t even manage to get us a whole Justice League line-up. Still, it was all we had, and we liked it, darn it. So, what figure am I looking at from this decidedly non-Batman-centric line? Batman, of course. 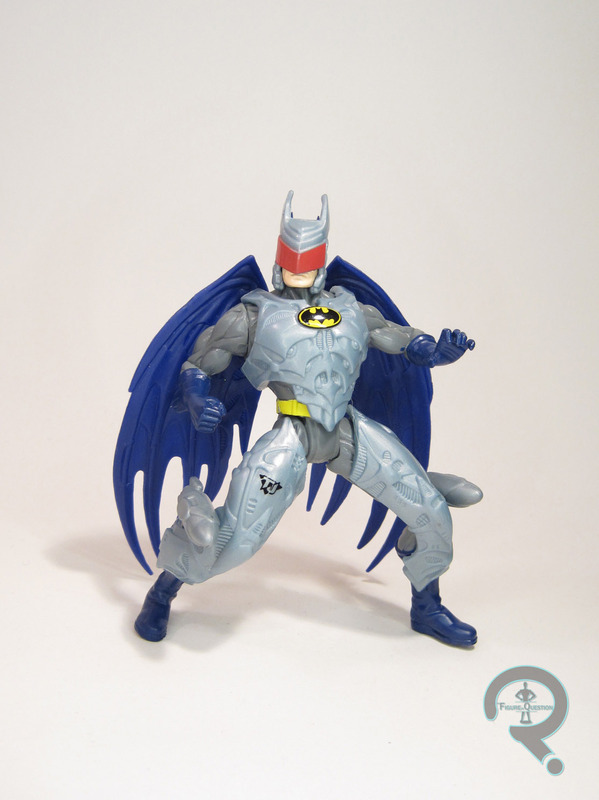 Batman was released in Series 1 of the Total Justice line, the first of two variants of the character available over the course of its run. This one was the more standard of the two. The figure stands 5 inches tall and he has 5 points of articulation, plus sliding glider wings. I know what you’re thinking: sliding glider wings? Why on earth does Batman have sliding glider wings? Your guess is as good as mine. I guess Kenner just wanted to do something different. Beyond the wings, we have a sculpt that is perhaps the most Total Justice-y Total Justice sculpt ever released. Pre-posed doesn’t *begin* to describe this guy. He’s contorted in all sorts of crazy ways. Why? Because he’s Batman, I guess. On top of that, his muscles are insanely detailed and just about to tear through his costume. His muscles have muscles. He’s likely beaten up crime and stolen all of its muscles, just to augment his personal supply of muscles. And then he used his fortune to buy a few more muscles on top of that. Lot of muscles is what I’m getting at here. The crazy thing about it all? I actually kind of like it. It’s crazy extreme, but the tiny details in areas like his boots and gloves are rather impressive. As insane as this sculpt is, someone was clearly having fun with it. The paint on Batman is decent enough, though it’s fairly basic stuff overall. A lot of the color work is just molded plastic, but what paint’s there is cleanly applied. Batman, like his line-mates, was packed with a bunch of goofy tactical armor. Because what Batman really needs is a set of tech-y armor with a rocket mounted on each knee. That’s so like him. I did not have this particular Batman growing up. I *did* have the JLA repaint, but he didn’t have the fancy Tactical Armor, and what’s this Batman without the armor? I picked this guy up from Lost In Time Toys, back during the holiday season, when they were running a 50% off sidewalk sale. This figure is kind of ridiculous, but in the best possible way. Oddly enough this is one of the only DC lines I can think of that I have never owned any figures from. The character selection was OK but I’m not a fan of the hugely overdone preposed sculpts. Had these been a little bit more in line with the Legends of Batman line I probably would have picked them up. These are the epitome of 1990s comic book design, aren’t they? If only they’d added a few pouches to each figure, they would have been peak ’90s. I have an almost complete set, as well as a good chunk of Hasbro’s follow-up JLA line, due largely to them being really the only DC figures on the market. If nothing else, I can thank this line for my first Green Lantern, Green Arrow, Aquaman, and Hawkman figures. That was a pretty big deal at the time.